Gemini™ Select 38 Series outdoor condensing units feature a single circuit factory-installed option on 25 to 65 ton units. Each unit has its own highly efficient hermetic scroll compressor(s). 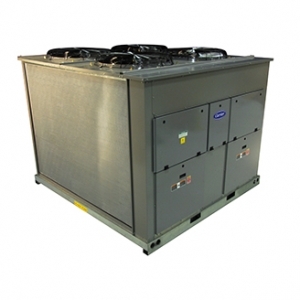 All units are factory-wired and easily connected by refrigerant lines and control wiring to the matching Carrier indoor air-handling units. Various combinations of condensing units with air handlers provide packages to cover a wide range of commercial cooling solutions. Low roof-load weight distribution and weatherproof construction enable an excellent selection for rooftop or on-the-ground installations on commercial and industrial air conditioning applications.